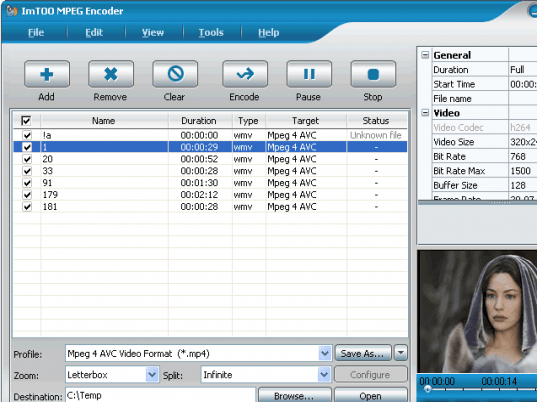 ImTOO MPEG Encoder is a powerful multimedia and graphics tool which helps you convert any video and audio formats. With this simple to use but highly effective tool you can make many conversions in the formats of video and audio files. The various formats that this program supports and can be converted into and from are DVD, VCD, SVCD, VOB, AVI, DV, MOV, animated GIF, swf, MPEG4, RM, WMV, ASF and many more. When you do not need a particular audio in a video file it can be removed using this tool. Similarly, audio can be simply extracted from a video file without removing it totally. Batch conversions can be completed even when the resultant formats are different for the individual files by altering settings. Preview files in order to ensure the results before completing the conversion process. The interface allows for most of the changes in the settings and huge processes can be completed within no time. This video software is badly flawed. When working from very large (over 10 GB) files, it creates a final mp4 that includes an occasional frame that is reversed and off-center. The result at playback is a flashing "blip" that interferes with the enjoyment of the video. When I brought this to the attention of the company, they put me through an endless series of tests as though I was their personal beta-tester. Soon, they started to repeat requests that had made previously. I`d had enough and I repeatedly demanded a refund, but they refused. They just kept demanding that I do more tests. Stay away from this company at all costs unless you don`t mind throwing away your money!